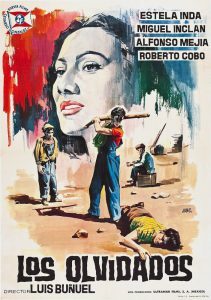 Dreaming Poor: Los Olvidados, Luis Bunuel’s 1950 film, tells the story of a group of children in Mexico City in the late 1940s, who seem to have no future. As the story begins, one boy, Jaibo, has just been released from juvenile detention; he reunites with his gang and shortly thereafter, gets into a scrape with another boy, Julian, who supposedly sent him to juvenile detention, and kills him. The witness to the murder, Pedro, is one of the film’s moral centers – he attempts to distance himself from Jaibo, and to be a good son to his mother, who is continually disappointed by him. Midway through the film, there is a dream sequence that recapitulates the major themes of Pedro’s story thus far – his shock at Julian’s death, his impoverished circumstances, the conflict represented by his mother and Jaibo – in a relatively straightforward, psychoanalyzable way. After the dream, Pedro is falsely accused stealing a knife that Jaibo stole, and sent to detention himself; he leaves, is robbed by Jaibo and eventually killed by him after shouting to a street full of people that Jaibo killed Julian. The film ends with Pedro’s mother, who had given up on him, searching him out. More than most of Bunuel’s films, this one seems to belong in the genre of neorealism – it has long sequences showing the poor at work, or looking for work, and even, in Pedro’s stint in juvenile detention, a somewhat didactic conversation between the detention authorities about possible solutions to the problems of poverty in Mexico. Bunuel objected to the neorealist program, writing in an essay that “neorealist reality is incomplete, official – reasonable above all else” and lacking “poetry, mystery.” In my clip, I suggest that even the seemingly fantastic moments in Los Olvidados are more neorealist than not. The film was met at first with outrage by Mexican viewers, who were particularly upset with Bunuel, a Spaniard, for portraying their country in a perceived negative light; the film has since been reconsidered, and was named in a 1994 poll by the Mexican magazine Somos as the second greatest Mexican film of all time. In my analysis of this clip, I compare the dream to a scene from Bunuel’s earlier film, 1929’s Un Chien Andalou, to demonstrate the way in which the imaginative force at work is itself impoverished in Los olvidados (this is true of Bunuel’s later work, as well, in which the visually inventive director establishes rich dreamscapes for his bourgeois characters not only in their dreams but even in their waking lives). By contrasting these two representations in the same director’s style, I want to suggest that Pedro’s quotidian dream, and the way in which his dreaming scene is introduced, serve to suggest that not only are Pedro’s actual circumstances severely constrained – this is something borne out by the plot of the film, in which his attempts to do right are constantly frustrated, and he is eventually killed by Jaibo – but also that even his possibilities for dreaming a better life are severely constrained, especially when considered in the context of Bunuel’s other investigations of the psychic life of the bourgeoisie.